A good salad needs three components to make it fabulous in my book: fresh veggies (or fruit), a tasty dressing and something crunchy to top it off. This salad has all those components, and it just smacks of spring. This recipe is from Your Homebased Mom. Check out her post to see some great pictures on how to make the sugared almonds. The almonds are so good! You might want to make a double batch, so you can snack on them! To make sugared nuts, combine nuts and 1/4 cup sugar in a small frying pan. Cook and stir constantly over medium heat for several minutes. The sugar will begin to clump up around the nuts and begin to melt. Continue to cook and stir until sugar has browned and coated the nuts. (Be very careful, the sugar can go from ooey-gooey deliciousness to burned in a matter of seconds!) Immediately remove from heat and pour onto a plate coated with cooking spray. Spread the nuts in a single layer and allow to completely cool and dry out. Once cool, the nuts can be broken into pieces. To make dressing, whisk together the oil, vinegar, 1/3 cup sugar, seeds, Worcestershire and paprika. Set aside for a few minutes, in order to let the sugar dissolve. Once the sugar has dissolved, whisk the dressing again before tossing with the spinach in a large bowl. Top the spinach with the strawberries, onion and cooled sugared nuts and lightly toss together. Serve immediately. Tip: Only make as much salad as you know will be eaten at once. The dressing breaks down the spinach, making it impossible to save leftovers. 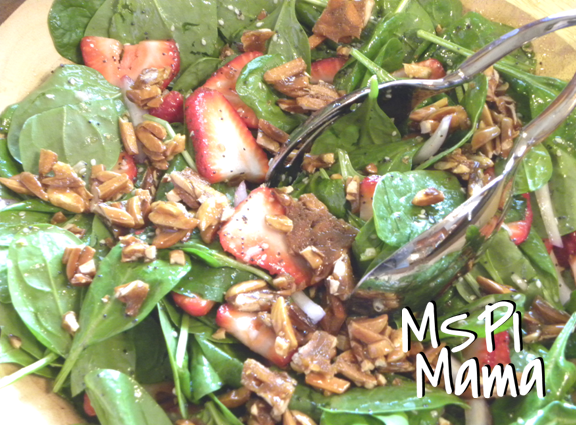 Adjust the amounts of spinach, strawberries and onion to your personal taste. I've made this dressing three times now. It's delicious!